The Wild Hunt was a folk myth prevalent in former times across Northern Scandinavia, Germany and Britain. The fundamental premise in all instances is the same: a phantasmal group of huntsmen with the accoutrements of hunting, horses, hounds, etc., in mad pursuit across the skies. Seeing the Wild Hunt was thought to presage some catastrophe such as war or plague, or at best the death of the one who witnessed it. Mortals getting in the path of or following the Hunt could be kidnapped and brought to the land of the dead. As Kris Kershaw has exhaustively documented (Kershaw 2001), the ritual reenactment of the Wild Hunt was a cultural phenomenon documented among many Gaulish and Germanic peoples. In its Germanic manifestations the Harii painted themselves black to attack their enemies in the darkness. The Heruli, nomadic, ecstatic wolf-warriors, dedicated themselves to Wodan. The Norse god Odin in his many forms, astride his eight-legged steed Sleipnir, was deeply associated with the Wild Hunt, particularly in Scandinavia. Odin acquired another aspect (to add to his many other names and attributes) in this context, that of the Wild Huntsman, along with Frigg. The passage of this hunt was also referred to as Odin's Hunt or Asgardareien. Otto Höfler (1934) and other authors of his generation emphasized the identification of the hunter with Odin, looking for the traces of an ecstatic Odin cult in more recent customs from German-speaking areas. "would argue a basis in an Indo-European warrior cult in which young warriors imbued with the life force fight with the characteristics of animals, especially, those of wolves, and are initiated into a warrior band [...]." This particular Wild Hunt was banished by the intervention of the monks of the monastery and the local nobility. While these Wild Hunts are recorded by clergymen, and portrayed as diabolic, late medieval English romance like Sir Orfeo, the hunters are rather from a faery otherworld, as in Celtic countries, where the Wild Hunt was the hosting of the Sidhe, the fairies; its leaders also varied, but they included Gwydion, Nuada, and Herne the Hunter. 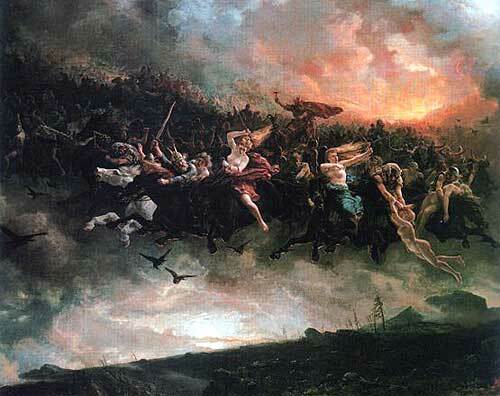 The Wild Hunt is known from post-medieval folklore of Germany, Denmark, Sweden, and to a lesser extent Norway. The myth of the Wild Hunt has through the ages been modified to accommodate other gods and folk heroes, among them King Arthur and, more recently, in a Dartmoor folk legend, Sir Francis Drake. A rare modern example of a Wild Hunt legend dates from the 1950s: a group of boys vandalising trees in Windsor Great Park came across a horn. Two of the boys refused to touch it, but the third picked it up and blew it. The call was answered by the cry of the hunt and the baying of hounds. The boys ran for a nearby church, but the boy who blew the horn fell behind. The hounds grew closer, there was the sound of a loosed arrow and the boy who blew the horn fell dead. No arrow was found, nor was a wound. In Quebec, the legend of the “chasse-galerie”, or witched canoe, is a favorite.